Easeus Data Recovery Wizard Software is a non-destructive and read-only file recovery utility that helps you recover all your important data lost after an accidental format, virus crash, partition loss, file/folder deletion or even sabotage. Easeus Data Recovery Wizard is an easy-to-use data recovery software tool which examines your inaccessible hard disk drive for damages and corruptions and recovers the data. Easeus Data Recovery Wizard is unmatched in its data recovery ability, save money and time with the powerful data recovery software. Provides Partition Recovery from FAT12, FAT16, VFAT, FAT32, NTFS/NTFS5 file system. Supports IDE/ATA, SATA, SCSI, USB, Fire wire (IEEE1394) hard drive and other media such as Floppy disk, USB flash drive, Digital camera, Digital audio player and so on. Recovers deleted files and folders even after recycle bin has been emptied or use of Shift+Del key. File recovery from deleted partition, lost or missing partition or formatted logical drive. File recovery from missing or lost folder. Recognizes and preserves long file names when restoring file and folder. 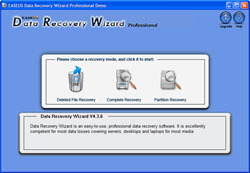 Easeus Data Recovery Wizard professional version supports recovery of compressed and encrypted files on NTFS. Changes the recovery file size. Large and Multi-Disk Drive Support. Data recovery from Windows 9x/ME/NT/2000/XP/2003. Can resume the last data recovery session.